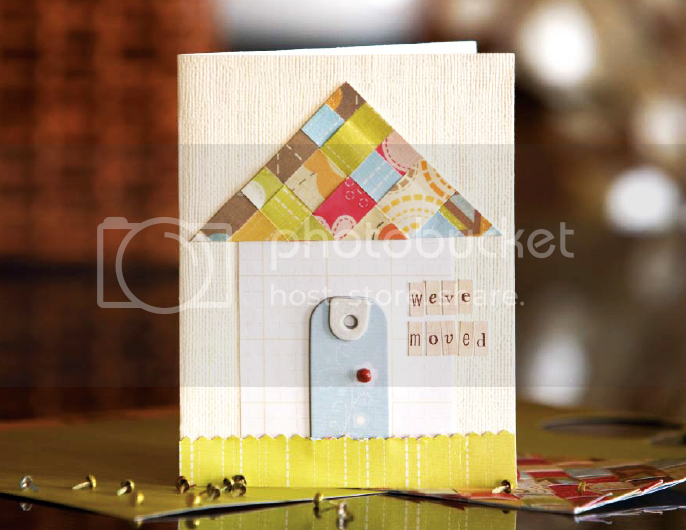 Card is 4.5 x 3.75"
How to: Begin with a yellow striped paper card base. Place a dimensional chipboard label on an oval of torn green patterned paper, then place the entire piece on an oval of torn red striped paper; adhere the embellishment on the card front. Add "HEY" white foam letter stickers on top of the label. Cut out two leaves from orange striped paper, crinkle them, then tuck them under the red striped paper to create a flower. Tip: The yellow striped paper is actually We R Memory Keepers packaging from decorative brads and the bird is cut out from a larger dimensional chipboard sentiment. How to: Weave patterned paper pieces on a scrap piece of cardstock then cut it into a triangle; adhere the triangle to the top of a cream card base. Cut a rectangle from grid paper and adhere it under the triangle to make a house. Trim down a dimensional chipboard label and adhere it to the bottom of the grid paper as a door. Set a brad through the door for a knob. Place "we've moved" mini letter stickers on the right side. Use pinking shears to trim the top edge of a piece of green striped paper, then adhere it across the bottom of the card as grass. Tip: Notice the glitter brad "doorknob" is centered in the middle of a flower printed on the dimensional chipboard label. Card is 6 x 6"
How to: Cut a 12x12 piece of pre-scalloped patterned paper in half, then fold one of the halves in half to create a fun shaped card base. Scallop the edge of a piece of rounded red patterned paper and adhere it to the card. Scallop the edge of a piece of rounded blue patterned paper and adhere it on the red patterned paper. 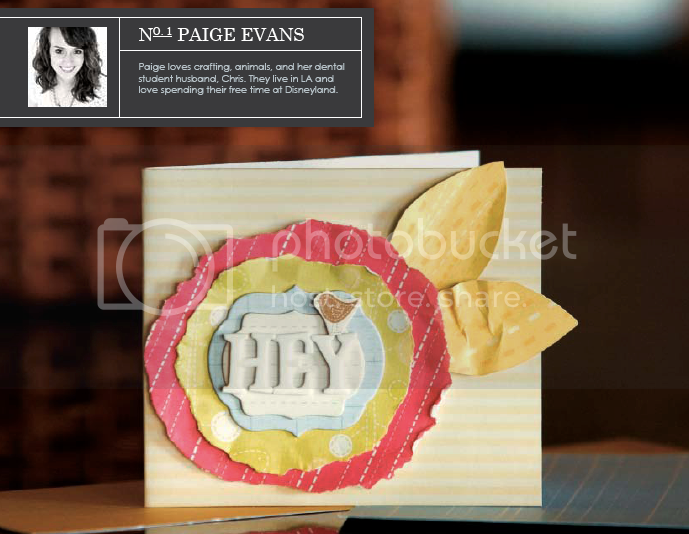 Shear the edge of a piece of rounded colored circles paper and adhere it on the blue patterned paper. Scallop the edge of a piece of rounded grid paper and adhere it on the colored circles paper. Fold up all of the scalloped edges to create dimension. Set green puffy "thanx" letter stickers along the curve of the grid paper. Place a dimensional flower brad under the sentiment. 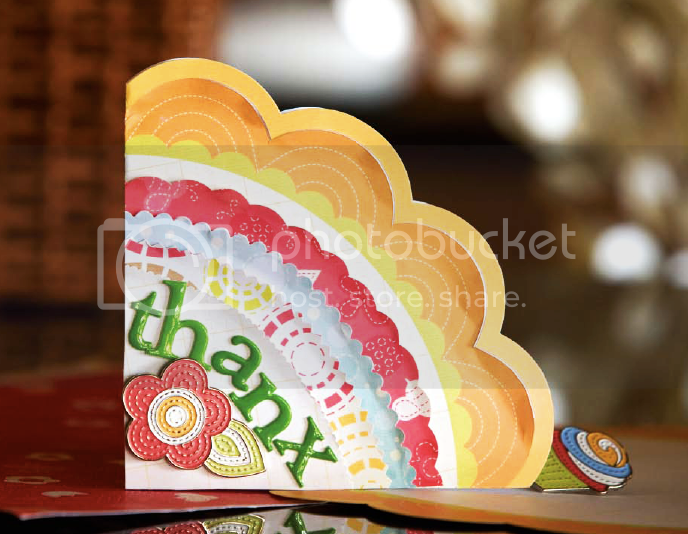 Using an Xacto knife, cut around the large scallop on the printed paper of the card base. Tip: You could also try cutting around the green scallops printed on the large scalloped paper to create even more texture. You are so talented. I love following your crafts. I love the "THANX" card! Such a cool and unique shape for a card!